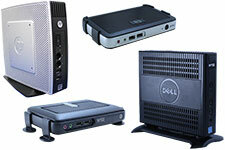 Thin Client Solutions - Information about thin clients and big savings on Dell Wyse and HP models. Fortune 500 companies as well as small to medium businesses are selecting thin clients for the bottom-line savings and user-empowering features of Wyse Winterm thin client terminals. What are the benefits of Thin Client computing? Are Thin Clients right for my needs? Dell Wyse and HP thin clients are designed with no moving parts that can break down or lose data. They deliver greater data security and virus resistance. These top quality new and remanufactured thin clients are quiet, easy-to-deploy, and simple to manage remotely. You can save even more using our thin client trade-in plan. Vecmar is your Dell Wyse and HP remanufacturing and repair center. Dell Wyse and HP devices available for immediate delivery! Vecmar carries many models of Dell Wyse and HP thin clients, so your order can often ship same day. Every high-quality Dell Wyse or HP thin client you order is protected with careful packing, including double-walled boxes. Our shipping department is experienced and proficient at importing and exporting thin, zero or cloud client devices anywhere in the world. All shipping options - including international - are available through major carriers. The Only Remanufactured Dell Wyse or HP Thin Client Backed by a FREE 3-year Warranty! Each remanufactured Dell Wyse or HP device you buy is backed by an unprecedented FREE 3-year warranty. Since 1990 Vecmar has been perfecting the Thin Client remanufacturing process for you. New thin clients include the manufacturer's warranties. Vecmar is a Wyse Winterm Authorized Service Center and Authorized Repair Center. Your new Wyse Winterm warranty claims will be quickly and expertly handled. Ask us about repairing or fully remanufacturing your company's Dell Wyse or HP thin, zero or cloud client devices.